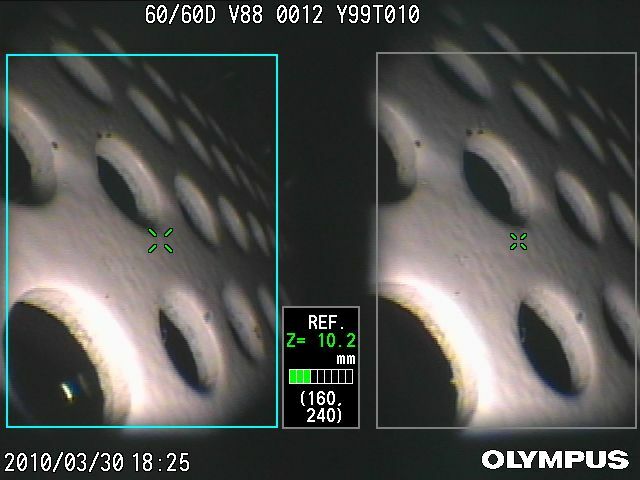 The 8.5 mm outer diameter videoscopes are suitable for large space inspections, featuring excellent brightness and scope insertion capability. Equipped with a removable Li-ion battery, the IPLEX LX and LT are ready for use wherever the inspection takes place. Whether the operator is crawling in confined spaces or working stationary in an aircraft hangar, the IPLEX LX and LT keep the size small without sacrificing features or functionality. The IPLEX LX and LT feature a compact and lightweight design, and even the model with 10m-long scope weighs just 3.9 kg, including the integrated Li-ion battery. They can be worn or carried with ease and set up almost instantly. The complete system, including all accessories and carrying case, is easily transported to job sites and small enough to fit in the overhead compartment of most aircraft. Despite being only 227 mm (8.9 in.) wide and 189 mm (7.4 in.) tall, the IPLEX LX and LT integrate a surprisingly large 6.5 in. monitor for exceptional visibility, whether at arm's length or across a workbench. At less than 100 mm thick including the pivoting handle/stand, the IPLEX LX and LT can be worn, stand upright, or be fastened to a tripod or mounting arm for operation in practically any environments. With their intuitive icon-based menu system, the IPLEX LX and LT require minimal or no training and can be easily operated by users of any experience level. Almost every menu and feature can be accessed by a maximum of three presses on the quick-access control buttons. And the TrueFeel™ scope tip articulation achieves easy and precise control. The handheld controller can be operated either independently or attached to the main unit during inspections, offering a versatile choice of operation. The stand-alone monitor can always be positioned for optimum viewing and is also convenient for group inspections and training. The ergonomic lightweight handset with TrueFeel™ articulation control has been engineered for comfortable operation even during prolonged inspections. The user can operate diverse functions and scope tip articulations easily, quickly, and precisely. The controller maximizes the use of buttons, levers, and joystick for quick access to all essential menu functions. Image enhancements, recording buttons, and measurement capabilities are among the many basic-to-advanced features at the operator's fingertips. The IPLEX LX and LT feature a simple menu, utilizing intuitive, internationally recognized icons that make it easy for the operator to quickly choose the right menu option. 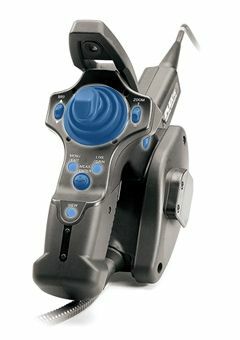 Navigation is simplified by a dedicated joystick, which functions independently from the scope tip articulation. The durability and environmental resistance of the IPLEX LX and LT provides exceptional reliability even in harsh environments. Whether you're conducting inspections outdoors in a variety of weather conditions, in a dusty or sandy climate, or in manufacturing areas, you can depend on the IPLEX LX and LT to function reliably in any surroundings. You can confidently bring the IPLEX LX and LT to almost any difficult environment. They can be used　in rain, sand, and dust, and withstand physical　shocks caused by drops and falls, ensured by　IP55 compliance. With its low-reflection display, the daylight-view monitor reproduces clear, vivid images even under the brightest sunlight. The IPLEX LX with the internal working channel passes a wide variety of environmental hazard tests compliant with internationally recognized military standards (MIL-STD-810F/G and MIL-STD-461F)*1, including blowing rain, humidity, salt fog, sand and dust, icing/freezing rain, and explosive atmosphere. *2 They also withstand rough treatment such as vibration and being dropped from heights up to 1.2 m (3.9 ft). *2 IPLEX LX and LT are not explosion-proof. The IPLEX LX is equipped with a high-temperature sensor that cautions with an audible beep and displays a visual warning if the scope is in danger of becoming overheated. The crush-proof insertion tubes of the IPLEX LX and LT are equipped with an innovative fine mesh tungsten outer braid that results in outstanding abrasion resistance. The tube's strength combined with its flexibility allows operation in the most difficult and hazardous inspection areas. The IPLEX LX and LT are designed with the unique Tapered Flex™ achieving superb scope maneuverability with optimized stiffness and flexibility. The increased stiffness of the new 8.5 mm scope allows it to be easily pushed deep into an inspection area without the use of a guide tube, making it ideal for long pipe inspections. Building on decades of experience in optical imaging, the innovative IPLEX LX and LT design provides superb image quality of inspected objects. The industry-leading 6.5 in. daylight-view monitor is larger than comparable videoscopes on the market, always allowing for a comfortable viewing position and convenience for group viewing. Superb image clarity permits the accurate detection of very small defects. The IPLEX LX features our unique image processing capability, WiDER™ (Wide Dynamic Extended Range). This innovative technology brings out detail in shadowed and highlighted areas to produce bright, contrast-balanced images across the entire depth of field. For optimum magnification and direction suitable for a variety of inspection environments, the IPLEX LX and LT offer a comprehensive range of interchangeable optical adaptors. The integrated LED illumination system brightly lights targets.For inspection of large voids where plenty of light is required,the 8.5mm scope is an ideal solution. Fitted within the scope tip, it delivers vivid illumination regardless of scope length and eliminates the need for a fiber light guide. In addition, the IPLEX LX is equipped with Hi-Beam mode boosting illumination up to 2X for expanded inspection capability, and the SmartTip™ automatic recognition function. The IPLEX SmartTip optical tip adaptors are automatically recognized when attached to the unit. It also provides instant notification if it starts to detach during inspection, preventing the loss of the adaptor inside the inspected object. The versatile IPLEX LX and LT offer far more than just on-site inspection. From image archiving to defect measurement and image management on a PC, post inspection tasks are made easier after returning from the inspection site. The IPLEX LX and LT feature high-quality JPEG still images and MPEG-4 movies that record into a removable USB flash drive. Saving or retrieving images requires only a single button press, and the thumbnail view makes it easy to instantly review the inspection results. Never before has a compact videoscope system offered such high-quality recording while retaining ease of use. For off-site inspection efficiency and report generation, the IPLEX LX and LT let you quickly and easily input titles in captured images. You can quickly identify the inspection location or result through the title to assist in archiving images. InHelp, the optional inspection data management and reporting software streamlines many aspects of remote visual inspections with the IPLEX. The software greatly improves work efficiency and simplifies inspections by organizing stored images on the IPLEX and generating detailed inspection reports on a PC with simple click-operation. The main unit's removable USB flash drive and Li-ion battery are contained inside a latched, sealed compartment for protection against environmental hazards and rough treatment. The IPLEX LX is a reliable, feature-rich system, providing precise measurement and foreign object retrieval. Our Stereo Measurement technology provides defect measurements from various angles with simple operation. With diverse measurement modes including distance, height and depth, the Stereo Measurement enables quantitative defect diagnosis. 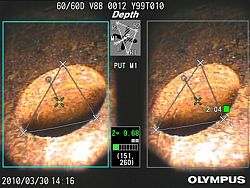 The measurement accuracy of a videoscope generally depends on the scope's distance from the target. Our unique Spot-Ranging™ feature, the industry's only real-time tip-to-target distance measurement tool, navigates the scope tip to the optimum distance from a target. The operator can then easily determine whether the tip is close enough to calculate the most accurate measurement on the first try. Adding to the array of versatile IPLEX LX benefits is a new 6.2 mm diameter scope featuring an internal working channel. Six retrieval tools allow you to remove foreign objects from inside inspection areas - ideal for helping avoid costly overhauls - and perform hook and drag inspections in engines. Both forward and side view Stereo Measurement tip adaptors are also available with the working channel scope, providing a complete inspection solution. *Available only in the USA and Japan.